As a visual effects designer and colourist for cinema, I work in a landscape that is dominated by large facilities with dozens, or even hundreds of employees with a high degree of specialism. You only need to look at the endcredits of a typical hollywood movie to get an impression. As a result, many of the images in todays visual effects blockbusters look remarkably (and depressingly) similar. Digital images for cinema have become a commodity and the people making them are as anonymous as the stone-cutters working on a medieval cathedral. 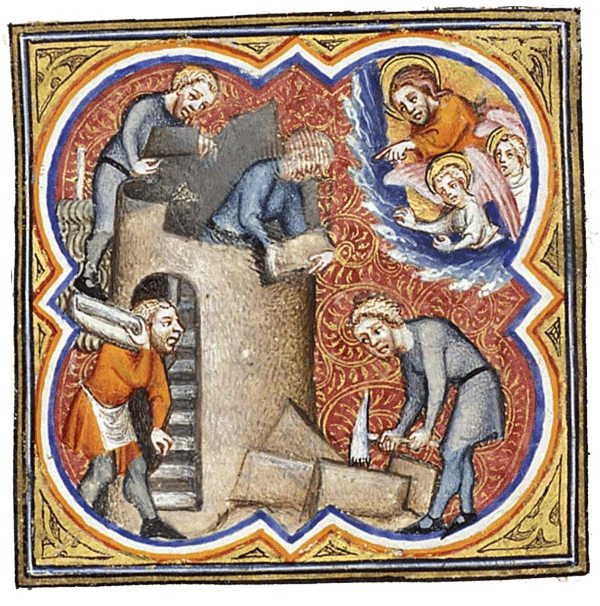 Illustration from a 14th century manuscript: Guiard des Moulins, Grande Bible Historiale Complétée. In contrast, in my own practice I am working relatively solitary, although filmmaking is always a collaborative exercise. On films like ‘Shock Head Soul’ and ‘Identicals’ which feature hundreds of visual effects shots ranging from small tweaks to complete digital environments I have done the bulk of the work myself, with additional work done by a freelancers that that follow my lead. With these films I started work on these before there was a finished script, and was the last person to touch the images before they were projected. As a result, images carry in a way my signature, and I feel I hold a certain level of authorship over the images. With each film that I work on becoming bigger in scale and budget I feel that I have pushed this way of working to its limits. On the next projects there will be more work, and there will be some pressure to do it at a higher pace. So the question rises whether I can find a way to adapt my way of working to accomodate these bigger projects, while maintaining and further developing my signature or fingerprint. A crucial one is that I really enjoy being hands-on with the images and don’t have any ambition to become a human resources manager. But I also know that there will be some level of hierarchy since a film director doesn’t want to have a conversation with ten individual crewmenbers. So I will need to explore collaboration methods that will allow me to be a solitary individual and at the same time be the conductor of the visual effects orchestra. Another aspect to this is what is my ‘sigature’ as an image maker? I think my work differentiates itself by being less obsessed with photorealism and being more stylized and, if you will, painterly. So as part of my research I also want to explore the material qualities of digital image making. On february 24 2013 Life of Pi won four Oscar awards, out of 10 nominations. The award for ‘Best Visual Effects’ went to the team at Rhythm & Hues. But Rhythm & Hues filed for bankruptcy a month before. One of the many memes floating on the internet after the bankruptcy of Rhythm & Hues. In recent years the biggest box-office successes can be categorized as ‘effects-heavy’ movies (www.boxofficemojo.com). 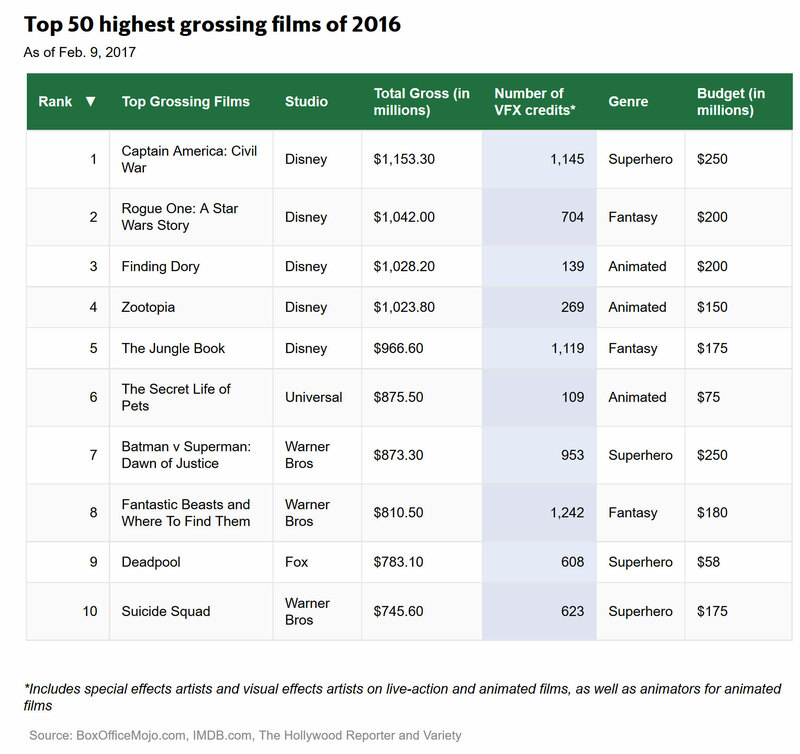 Just in 2016 the top 20 is entirely dominated by movies that feature heavy digital work or are entirely animated. Actually if you look at commercial successes in cinema for the last century, the list is dominated with movies that rely heavily on effects. At the same time the industry responsible for this work – the visual effects industry – is struggling to keep it’s head above water financially. In the 10 years between 2003 and 2013 over 20 studios closed or filed for bankruptcy (http://www.insidevfx.com/visual-effects-company-list), the contrast became most painfully clear at the 2013 oscars, leading to over 500 vfx workers protesting in front of the venue hosting the Oscars ceremony. 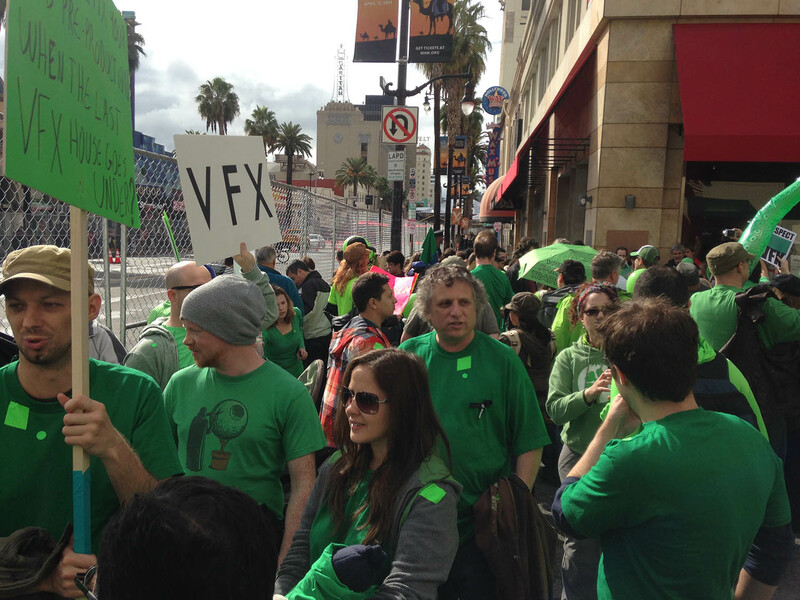 VFX professionals protesting the failing industry at the 2013 Academy Awards venue. The problems underlying these struggles are many and complex – partially having to do with local and international trade politics. I have listed some of the many articles that paint the picture in more detail at the end of this post. In summary some countries (the UK, Canada, New Zealand, even Belgium) have been implementing tax constructions that effectively subsidize the work done on film productions. As a result is has been cheaper to make films in London or Vancouver than in Hollywood, and it’s cheaper to take a film to Brussels than finish it in Amsterdam. Studios have responded to these tax schemes by opening up locations in these locations to be able to still attract the work on big budget movies. Many studios advertise their eligibilitity for tax shelters on their websites. In the mean time the level of craft in visual effects has reached the point where virtually anything we can imagine can be created and seamlessly integrated into live- action material. 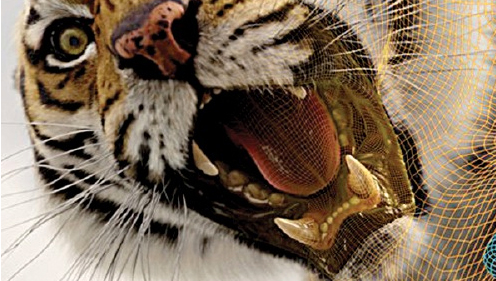 So with a lot of effects work effectively invisible – and your tiger being as good as mine – I’m not surprised that many studios are struggling to negotiate more feasible budgets for digital production. So where am I in all this, and why do I care? The truth is that as a visual effects designer I am not directly affected by these issues (yet). I have been working ‘in parallel’ to the more conventional film industry. I have worked on relatively small scale art-house films with directors that specifically choose to work with me. But the next projects will be larger in scale and one of the challenges I will be facing is to scale up – and thus I need to make sure I don’t step into the fire that is burning in the neighbours house so to speak. I have some ideas about the direction I can take – and on this blog I will document the design research I do. Life After Pi is a short documentary telling the story of the bankruptcy of Rhythm & Hues, the studio responsible for the Oscar-winning effects on ‘Life of Pi’.